Conversations about historic preservation address the best way to maintain the physical integrity and historical significance of a building, structure, or site. Which construction materials should be used to restore a structure? How will a building be adapted to serve a new function? What can be done to reconstruct a site that has not existed for hundreds of years? All of these questions must be considered during the process of historic preservation, and each project can produce unique answers. In 2010, the Architecture Archives at the University of Florida Smathers Libraries acquired a significant collection of papers, blueprints, and photographs documenting the work of renowned architect Herschel E. Shepard. Born in Jacksonville in 1931, Mr. Shepard is one of Florida's leading experts in historic preservation. He has been involved in the restoration of landmark buildings such as the 1902 Florida State Capitol in Tallahassee, and has worked extensively in St. Augustine since 1970. 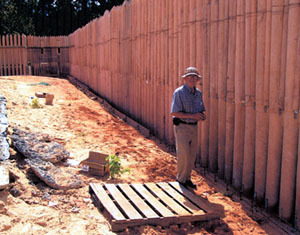 He was also on the faculty of the University of Florida's School of Architecture for eleven years, retiring in 1996. This online exhibition explores the conversation that occurred during three of the historic preservation projects Mr. Shepard was involved in: the ongoing Gamble Mansion restoration, adaptive use at Government House, and the reconstruction at Mission San Luis de Apalachee. "I believe that it is the preservation of past and present knowledge and beliefs, often represented by these [artifacts and buildings], that is so important." Whether it involves restoring a plantation home, repurposing a former post office or reconstructing a council house from the 1600s, historic preservation differs among sites. Each project requires fresh eyes, as no two historic structures are exactly alike. They may interpret different periods in history, be constructed of different materials and have very different uses. Although the conversation about completing each of these historic preservation projects has differed, the goal to recognize and care for Florida's architectural heritage remains the same. 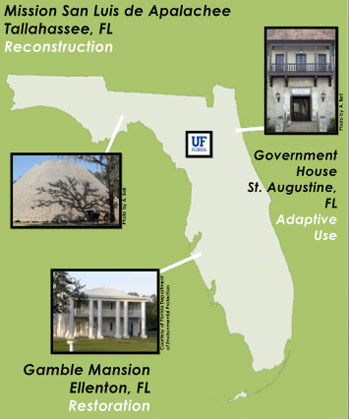 The map below shows three historic preservation projects undertaken by Herschel Shepard in the state of Florida. This online exhibition was created in 2011 by Austin Bell, Renee Kiefer, and Kim Tinnell, graduate students in the Museum Studies program at UF. The exhibition was produced with guidance from Herschel Shepard, Cindy Peterson, John Nemmers and Prof. Glenn Willumson. Credits for Photos Above: Gamble Mansion photo courtesy of Florida Department of Environmental Protection. Photo of Herschel Shepard courtesy of Mr. Shepard. Other photos by A. Bell.